Is This The Title And Release Date Of Kasabian's New Album? Eagle-eyed fans have spotted a new Amazon page that could hint at the details of their sixth LP. Last week, Kasabian confirmed their sixth studio album was complete, posting a picture of a notepad with the words "album done" on Twitter. Now, a new page on Amazon has popped up which has added to speculation surrounding the album's name and release schedule. 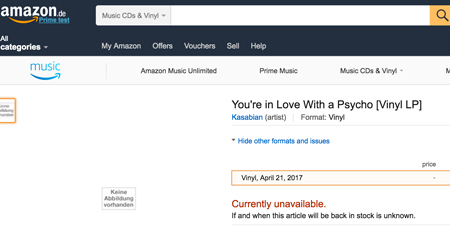 A German listing on the online shopping site details the release of a vinyl LP entitled You're in Love With a Psycho on 21 April 2017. If indeed the album was named as above, it would match the Leicester band's album track of same name, which was previously confirmed by Q Magazine. However, looking at the scribbled out notebook in Serge Pizzorno's picture, if the left hand side represents the album title, and the right page represents the tracklisting, the album name looks a little shorter than what's being speculated. While details of Kasabian's sixth album are very much up for debate, one thing for certain is that they will be heading out on live dates this year. The Club Foot four-piece have already been confirmed to headline Reading & Leeds, joining previously announced headliner Muse on the bill. Eez-Eh outfit have also announced European festival dates, including headline slots at Croatia's INmusic Festival, Hungary's Sziget Festival and Spain's Benicassim Festival. Tom Meighan and co. have even planned a short Italian tour-playing shows in the country of guitarist Serge's origin.